This toy helps to burn the excess enrgías and stimulates you mentally through their natural instincts.You will have as well a pet is happier with a lower risk d e develop behavioral problems originate from fear,aggression or boredom. 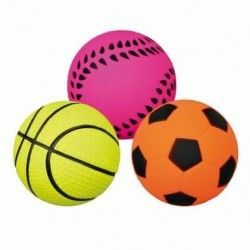 - Enter some awards dry the ball for the opening round.The prizes must not exceed 10mm. -Slide the ball next to your pet to attract your interest especially when it falls the prize. -Let take a sniff of the ball and continue playing by yourself to get food, and fun. 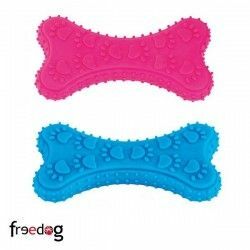 Although this toy is made of durable material,no toy is indestructible. Choose the toy appropriate to the character of your pet. Supervise your pet at all times while playing. Inspect the toy regularly and replace it if is broken. 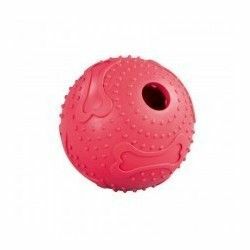 Description: Aid Toy Ball This toy helps to burn the excess enrgías and stimulates you mentally through their natural instincts.You will have as well a pet is happier with a lower risk d e develop behavioral problems originate from fear,aggression or boredom.